Skywee presents state of the art presents the new Solar Bird Bath Fountain Pump. Make your neighbours feel envious with this stunning bird bath. It is designed specially to make this bird bath truly inimitable. Frostiness and weather-resistant construction makes this perfect piece to endure in outdoors. You can also add sand or water to the base pole. It will bring further firmness if required. It is an attractive stuff on which the charming birds get attracted to. This solar panel is made of premium quality Polycrystalline Silicon. This is a waterproof product and an indispensable pump for your garden. It comes with four different nozzles which can easily change the height of the water. Generally the water rises up to 50 cm approx. This is an eco friendly solar fountain pump where the built in battery is powered by solar.One year warranty. For any questions, please feel free to contact us directly, we will offer 100% satisfying solutions. ◆Restart: If the sunlight is away, to restart within 3 seconds once sunlight is back. 1. Put the motor totally into the water and keep the nozzles above the water. Make sure the parts are fixed firmly on the bottom of the fountain to avoid vibration. 2. Connect the wire of the motor to the solar panel. 3. Place the solar panel under strong sunlight, it's better to face the sunlight directly. [Auto Turn On/Off] Designed by water inductor, the pump motor automatically starts to work in water and it auto shuts off as soon as less water or it leaves water, to avoid shorting the lifetime if working without water. 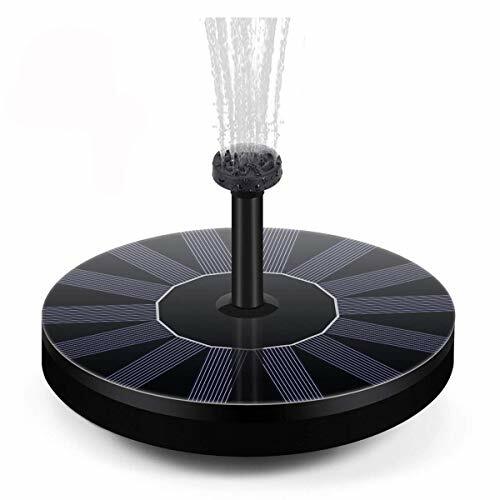 [Battery Backup] The solar fountain is completely driven by solar energy into its built-in battery when exposed to sunlight, allowing it to continue working for extra 3-4 hours without sunlight, unlike other solar fountains which stop working onces there is week or no sunlight. [Multiple Choices of Sprayers] Allow you to combine 8 different options of water fountain patterns and different water rising heights from 30-50cm.It gives you flexible uses on different occasions. [Product Advantages] This fountain can aerate the pool to increase the pH of water and keep water circulating to improve pond and fish life. [Mulitple Applications] The solar pump is used for working pefectly on bird bath, fish tank, pond, garden decor. It brings in water circulation for oxygen as well as cacthing all of the attention of the neighbors to your garden. View More In Water Gardens & Ponds. Have questions about this item, or would like to inquire about a custom or bulk order? If you have any questions about this product by Skywee, contact us by completing and submitting the form below. If you are looking for a specif part number, please include it with your message. Sign up to be the first to know about our Exclusive Sales, Special Offers, & Member's Only Discounts! © 2019 - stores.net.co. All Rights Reserved.